That's all from the BBC Africa Live page today after Donald Trump's stunning victory in the US presidential election. Keep up-to-date with what's happening across the continent by listening to the Africa Today podcast or checking the BBC News website. Our African proverb of the day: A small plate goes and a small plate returns. " Click here to send your African proverbs. Liberia's President and Nobel Peace Prize winner Ellen Johnson Sirleaf says she is disappointed that Hillary Clinton did not win the US elections. In an interview with the BBC, Africa's first democratically elected female president said: "We are extremely saddened by this missed opportunity on the part of the people of the United States to join smaller democracies in ending the marginalisation of women. "However, Liberia has a long and historical relationship with the United States and we expect the good relationship to continue." Though Ms Sirleaf is worried about existing agreements between the US and her country, she concedes it is too early to say what Mr Trump's presidency will mean for Africa. "I'm worried about trade deals for Liberia, for Africa, I'm worried about investment and the special programmes that have been put in place by President Obama and by President George Bush before him. "And we just don't know what the new policy towards Africa will be under a Trump administration. We'll have to wait and see. Obviously, we are concerned but we have to just give him the benefit of the doubt." The only English words she knew then were "hello" and "shut up"
Now for some other news... Oil giant Shell says it has shut down one of its flow stations in Nigeria's Delta region due to a protest at the facility. Demonstrators at the Escravos station said this was their eighth day of protest against the lack of good roads, electricity and water supplies. Militants demanding a greater share of Nigeria's oil wealth have attacked a number of pipelines in recent days. A pipeline carrying crude oil from Shell's Forcados terminal has been sabotaged three times in the past week. Militancy in the Niger Delta has increased since President Muhammadu Buhari was elected last year. Hillary Clinton says that, despite the disappointment of losing, "I still believe in America - and I always will." She also says the peaceful transfer of power is a cornerstone of US democracy, and urges her supporters to approach the Trump presidency "with an open mind". Mrs Clinton added: "We must accept this result. Donald Trump is going to be president. We owe him an open mind and a chance to lead." The defeated Democratic candidate has made her first comments since accepting defeat in the US presidential election. Hillary Clinton says she has congratulated, and offered to work with, President-Elect Donald Trump. "I hope that he will be a successful president for all Americans," she says. Quote Message: Following the presidential election in the United States, The Elders believe that the ideals, magnanimity and empathy of their founder, Nelson Mandela, offer a model of ethical leadership for the new Administration. Following the presidential election in the United States, The Elders believe that the ideals, magnanimity and empathy of their founder, Nelson Mandela, offer a model of ethical leadership for the new Administration. On Saturday the five nominees for the BBC African Footballer of the Year 2016 will be revealed and voting will open. The names will be announced in a live show on BBC World TV and BBC World Service radio, starting at 18:00 GMT. Fans of African football worldwide will be able to vote via the BBC African football website from 18:50. Voting will close at 18:00 on Monday, 28 November and the winner revealed live on Focus on Africa TV and radio on Monday 12 December at 17:35. Donald Trump has been declared the winner of the US presidential race after winning more than 270 electoral votes. His challenger Hillary Clinton, however, leads him in the popular vote - she has 59,299,381 votes nationally, to Trump's 59,135,740 — a margin of 163,641, NPR reports. She is set to become the fifth US presidential candidate to win the popular vote but lose the election, the report adds. A tweeter has reminded Uganda's long-serving ruler Yoweri Museveni about how many US presidents he has worked with. That was in reaction to a congratulatory tweet Mr Museveni, 72, sent to Mr Trump, 70. Senegal's President Macky Sall also congratulated Mr Trump, saying the West African state "plans to continue its strong ties with the USA". Democratic Republic of Congo President Joseph Kabila said that Mr Trump's had achieved an "outstanding" victory and he was "ready to work with the president-elect to strengthen the ties of friendship and cooperation". DR Congo was due to hold presidential elections this month but they were controversially postponed, opening the way for Mr Kabila, in power since 2001, to remain in office. Residents of US President Barack Obama's ancestral village in western Kenya have expressed displeasure following Donald Trump's victory. I feel the elections were not really fair. Clinton should have won, she had more votes in Kogelo compared to the United States." I am not happy with it any more because I was expecting Hillary Clinton to be the winner of this election due to our brother Barack Obama who was supporting her. " Trump told America: "It is time for us to come together as one united people"
Let's look at some news away from t he US election... The first group of Kenyan troops serving with the UN peacekeeping mission in South Sudan has arrived home. A defence spokesman said a total of about 1,000 soldiers would be be flown out in batches over the coming days. Last week, Kenya said it would withdraw all its forces from South Sudan after the Kenyan commander of the UN mission was sacked. A UN inquiry found the peacekeepers failed to respond to an attack on a hotel during fighting in the capital, Juba, in July. Nigeria's is a major oil producer, but has seen a drop in exports to the US. 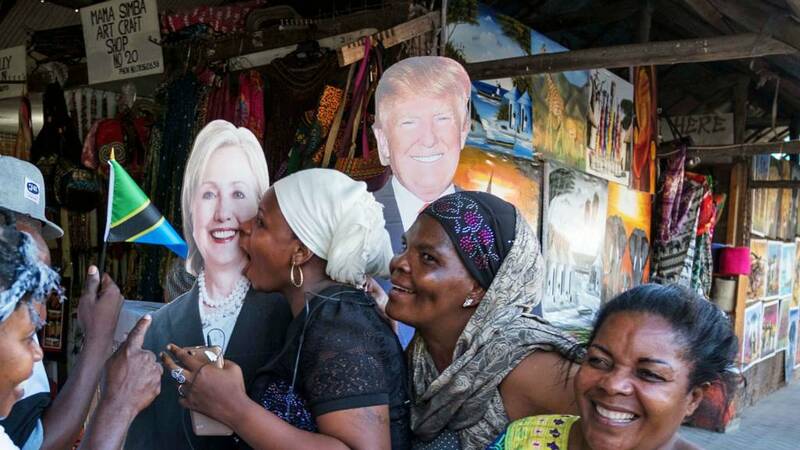 Trump win: Bad for African trade and aid? Leading South African foreign affairs correspondent Simon Allison has been giving his perspective on what Donald Trump's victory means for Africa. Quote Message: Trump doesn’t like trade deals, especially ones that he thinks are weighted against America. The African Growth and Opportunity Act (Agoa) is a prime example: It’s designed to give African countries easier access to US markets by scrapping import duties on certain goods. Trump doesn’t like trade deals, especially ones that he thinks are weighted against America. The African Growth and Opportunity Act (Agoa) is a prime example: It’s designed to give African countries easier access to US markets by scrapping import duties on certain goods. Quote Message: Non-oil exports from Africa to the US, under the auspices of Agoa, have now reached $4.1bn (£3.3bn), which makes it a vital economic lifeline for the continent. Chicken farmers aside, South African businesses have been among the major beneficiaries of the trade deal, but how long will a Trump administration maintain this tax-free access to US markets? Non-oil exports from Africa to the US, under the auspices of Agoa, have now reached $4.1bn (£3.3bn), which makes it a vital economic lifeline for the continent. Chicken farmers aside, South African businesses have been among the major beneficiaries of the trade deal, but how long will a Trump administration maintain this tax-free access to US markets? Quote Message: Trump is not a fan of foreign aid, and America’s extensive aid programme is likely to suffer significant cuts. So what, some might say; aid is always a controversial topic, with the jury still very much out on whether it does more harm than good. Trump is not a fan of foreign aid, and America’s extensive aid programme is likely to suffer significant cuts. So what, some might say; aid is always a controversial topic, with the jury still very much out on whether it does more harm than good. Quote Message: Nonetheless, in the short term, expect cuts to key infrastructure and healthcare programmes across the continent, with no other foreign donors likely to step in to fill gaps. Nonetheless, in the short term, expect cuts to key infrastructure and healthcare programmes across the continent, with no other foreign donors likely to step in to fill gaps. Quote Message: It’s already difficult to be gay in Africa, and life is only likely to get harder under Trump, who is opposed to gay marriage in the US. This stance is likely to embolden African leaders who have persecuted LGBT communities in their own countries, such as Yoweri Museveni’s Uganda. Even South Africa voted this week to scrap a United Nations gay rights watchdog. It’s already difficult to be gay in Africa, and life is only likely to get harder under Trump, who is opposed to gay marriage in the US. This stance is likely to embolden African leaders who have persecuted LGBT communities in their own countries, such as Yoweri Museveni’s Uganda. Even South Africa voted this week to scrap a United Nations gay rights watchdog. Quote Message: The trend in Africa is already negative when it comes to gay rights; a Trump administration certainly won’t try very hard to halt this trend, while his very public stance against gay marriage may even accelerate it." The trend in Africa is already negative when it comes to gay rights; a Trump administration certainly won’t try very hard to halt this trend, while his very public stance against gay marriage may even accelerate it." Prominent Nigerian televangelist TB Joshua's name is the second-most trending topic on Twitter in the West African state after he wrongly "prophesised" victory for Hillary Clinton in the US presidential election. At least 40,000 tweets have been shared using his name. Donald Trump had a "gracious exchange" with Hillary Clinton and a "warm conversation" with Barack Obama, according to Trump's campaign manager, Kellyanne Conway. Conway told ABC and NBC News that Clinton's top aide, Huma Abedin, called her late on Wednesday night and connected Clinton and Trump. Abedin said Clinton "congratulated him for his victory", and he called Clinton "very smart" and praised her "tremendous campaign". Away from the US.... A Sudanese opposition party says its leader has been arrested, bringing to at least 10 the number of senior opposition figures detained in the past two days. The head of the Sudanese Congress Party, Omar Al-Digair, was picked up by security forces at his home in Omdurman, near the capital Khartoum. Opposition parties have been calling for protests against last week's subsidy cuts which led to a 30% increase in the price of fuel. There were deadly protests in Sudan three years ago when the government reduced fuel subsidies.